FIFA is considering employing the Hawk-Eye technology that many of us are already familiar with from Wimbledon and other leading tennis tournaments. Hawk-Eye's inventor has said that he could develop goal-line technology that could decide whether or not a goal had been scored in under half a second. The International Football Board (IFAB) is currently asking companies to tender systems that will decide on the veracity of a goal being scored in under a second. "Our system for football is easier than for cricket, technically," said Hawk-Eye inventor Paul Hawkins. "Technology is not here to hurt anyone, it can only make things better." 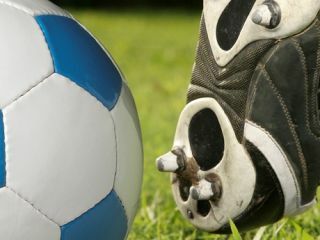 The IFAB is looking at new technologies this year and hopes to make a final decision on what to use by March 2011. If only they had employed such technology in the 2010 World Cup finals match, when Frank Lampard scored a clear goal that was, painfully, not given, leading England to lose 4-1 against Germany. Hawkins, chief exec of Hawk-Eye Innovations, explains that the system for football is very similar to the multiple-camera system already used in cricket and football. Another company pitching for FIFA's business is German company Cairos which uses a system in which a silicon chip is fitted inside the football and, according to MD Christian Holzer system is "100% accurate." Fifa has, in the past, publicly dismissed goal-line technology. Speaking to the BBC back in 2008, Dawkins explained that he was angry that Fifa had decided not to implement Hawk-Eye technology for use in 2009, even though it looked as if a deal for the tech to be installed had been put in place. "We have invested an awful lot of money and now we have no return on that. I am livid," he explained. Dawkins will be hoping that this latest 'interest' in the technology from Fifa turns into something more concrete.